In a Nutshell: Discover’s latest offering — the Discover it® Business Card — focuses on features that benefit the small business owner. Cardholders receive 1.5% cash back and Discover will match that amount for the first year, for an initial annual total of 3% cash back. The card also comes with important protections for small business owners like fraud protection, free employee cards, and free social security number alerts. Discover’s award-winning customer service is also built into the Discover it® Business card, with live operators working 24/7 to assist with any questions or concerns. One of my favorite part-time jobs as a college undergrad was working in a local electronics repair shop. The owner and his one full-time employee were wizzes when it came to fixing a tv on the fritz or bringing an old turntable back to life. But I suspect there were other parts of the business that weren’t as easy to manage for someone with soldering skills approaching an art form but with no formal background in running a business. Bills, invoices, and a cadre of random paperwork towered on an often-neglected desk near the office’s main computer. If we needed a last-minute part that could be found in town or other eleventh-hour supplies, the owner would hand over his personal credit card for a quick trip to the store. I imagine once the bills for these purchases came in, it wasn’t a simple task to remember and categorize which purchases were for the business and which ones were personal purchases. In the end, this approach got the job done, but the owner could have likely saved some headaches and some cash as well by carrying a business credit card. The new Discover it® Business Card would have been a perfect option for him, with its straightforward benefits structure and award-winning customer service. 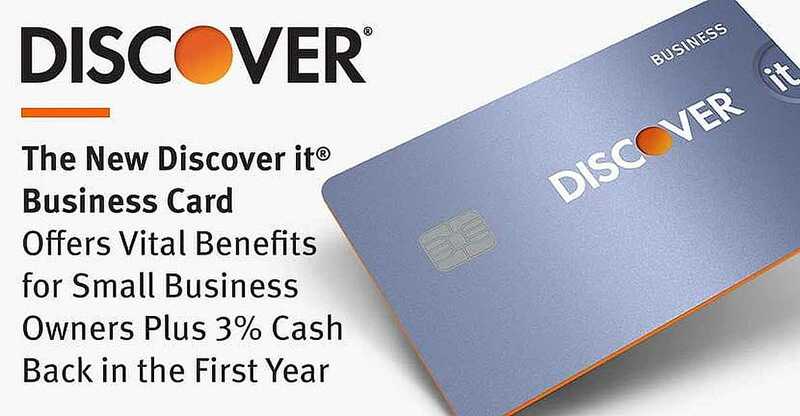 “The Discover it® Business Card is a great choice for any small business owner who wants a simple credit card that offers unlimited 1.5% cash back on all purchases,” said Andrew Hopkins, Senior Vice President of Marketing at Discover. Additionally, Discover it® Business cardholders will receive an unlimited dollar-for-dollar match of the total cash back earned in the first year for a total of 3% cash back in the first 12 months. This added feature sets the card apart from a number of its competitors. With an automatic 3% cash back at the end of the first year, this provides a simple way for small business owners to put money back into their accounts just by using the card to make purchases they would likely need to make regardless. Hopkins said there is also no annual fee associated with the card. The card comes with a 0.0% introductory APR for 12 months on purchases. Afterward, a 14.99% to 22.99% Standard Variable Purchase APR applies. 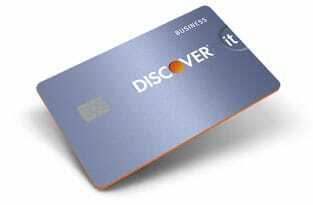 For individual cardholders and small business owners already familiar with Discover and the service that comes along with it, this new business card offering makes sense to be up for consideration. “The Discover it® Business Card is a smart, simple, and rewarding credit card that puts all the features and benefits that Discover cardmembers love and rely on in the hands of business owners,” Hopkins told MarketWatch. These benefits include some key features that should stand out for small business owners. Keeping track of expenses is of vital importance for any business owner, and Discover it® customers can more conveniently document and organize their business expenses by downloading them into Quicken, QuickBooks, and Excel. 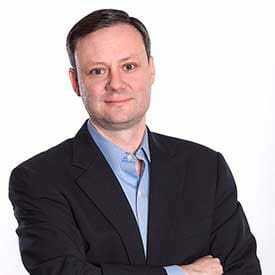 Andrew Hopkins is the Senior Vice President of Marketing at Discover. The Discover it® Business Card also keeps security considerations front-and-center with some important features that help protect businesses. With its $0 Fraud Liability Guarantee, Discover ensures that the cardholder will never be held responsible for unauthorized purchases on the card. And with its social security number alerts, the cardholder will be notified if Discover finds his or her social security number on any of thousands of risky websites. The Discover member can also freeze their account in seconds to prevent new purchases, with the availability of an on/off switch on the mobile app and website. Cardholders will also receive a free Credit Scorecard that includes their FICO® Credit Score and number of recent inquiries, among other information. Finally, with the Discover it® Business Card, business owners can add employee cards with spending limits at no cost and earn rewards for purchases made with the cards. Other advantages the Discover it® Business Card offers over competitors include no increased APR for late payments, no late fee for the first late payment, no overlimit fee, and no foreign transaction fee. Hopkins said he believes the Discover it® Business Card stands out for its simple reward structure of 1.5% cash back on all purchases with no limits and no annual fee, but he thinks the card really shines with the level of service it provides to customers. “If you’re asking which feature is my favorite, I’d have to go with our customer service,” he said, adding that Discover has been recognized by J.D. 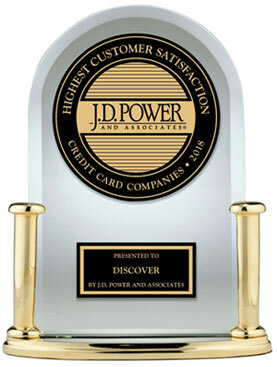 Power as having the highest customer satisfaction among credit card companies, four out of five years in a row. “The US Credit Card Satisfaction Study, now in its 12th year, measures customer satisfaction with credit card issuers by examining six factors (in descending order of importance): interaction; credit card terms; communication, benefits and services, rewards, and key moments,” according to a J.D. Power press release. The study includes responses from 24,018 credit card customers and was fielded from September 2017 through May 2018. Hopkins said cardmembers can talk with a live person, based in the US, day or night, 24 hours-a-day, seven-days-a-week, if they have any questions, issues, or concerns with their account. “I think that’s especially important for business owners who already have a lot on their plates running their businesses,” he said. Convenience and flexibility are also important considerations, and Discover it® Business Card customers can pay their bill by phone or online up to midnight Eastern Standard Time on the day the bill is due, and there is no fee to pay over the phone. Interested business owners can apply online at the Discover it® Business Card application page. I’m happy to report that the last time I visited my alma mater, the electronics repair shop was still thriving with one of the best reputations in town. It’s been a while since I was an employee of the shop so I can’t say whether the owner ever streamlined his approach to managing his business expenses but the fact remains that the Discover it® Business Card would be a great choice for his company.